After literally exploding onto the music scene during the late �70�s, the Mighty Van Halen emerged as the hottest rock and roll band on the Sunset Strip. With the ever flamboyant Diamond David Lee Roth and guitarist extraordinaire Edward Van Halen spearheading their attack, Van Halen became the quintessential �party� band. If you were lucky enough to have seen Van Halen back in their hay day then you were witness to one of the most extraordinary live bands in the history of rock and roll, and if you didn�t, you had really missed out. . .until now! 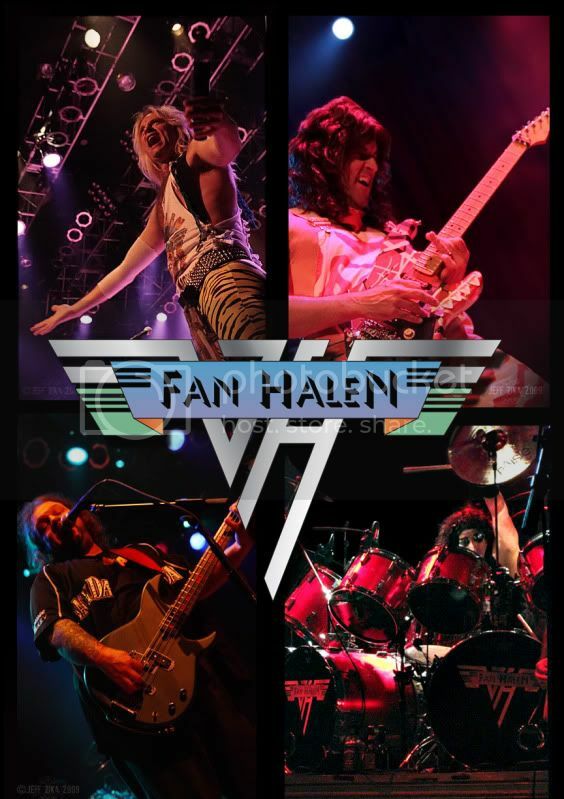 FAN HALEN brings back the party-time hard-rocking live music of �Classic� Van Halen with a true-to-life tribute to not only the band but the spirit of an era! FAN HALEN sets the stage for a night with Dave, Eddie, Alex and Michael, in a transformation that has been described as "amazingly authentic." Sure there's other Van Halen tribute bands out there but NONE that are more authentic and true to the original band...just take a look and listen...in most cases those other Van Halen tributes have only two members that resemble the original band...would you really want to go see a Beatles tribute and only the John and Paul look and sound like members of the Beatles and the George and Ringo look like two ordinary guys that just strolled in off the street? Well this is what you get with those other Van Halen tributes! No other tribute to Van Halen more closely captures the live Van Halen show and experience than FAN HALEN! From the look of the band, the outfits, the choreography, the note-for-note reproduction of some of the greatest rock songs ever performed to the sonic energy of the performance nothing is overlooked...in other words, for those 60-minutes while FAN HALEN is on stage they are Van Halen!